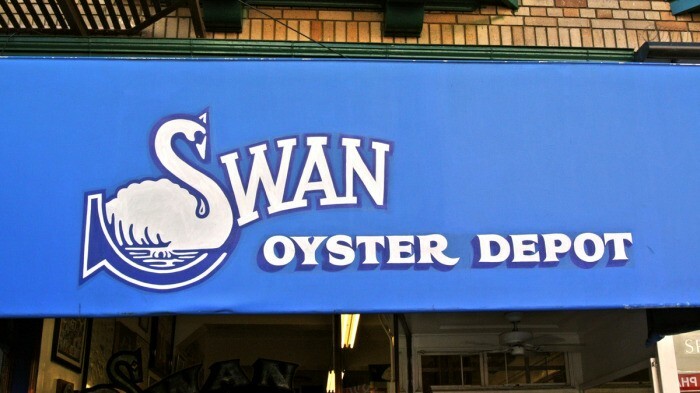 Ah yes, the world famous Swan Oyster Depot. 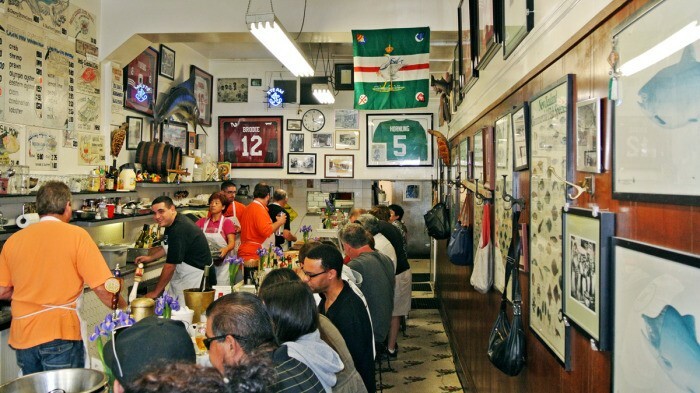 This 100-year-old Lower Nob Hill institution is certainly one of the more famous San Francisco eateries and I’m lucky enough to live on the same block as this revered bastion of seafood. With a place so good, so close by you’d probably expect to find me there on a weekly basis, but there’s two things that constantly hold me back – open for lunch and there’s constantly tourists lined up out the door. Literally every single time I’ve walked by this lunch-only hot spot – between their opening at 10:30 AM and their closing at 5:30 PM – there has been a substantial line to contend with. This is a very discouraging sight for someone like myself who absolutely refuses to wait in lines for anything, no matter how amazing the results may be. But one Friday, I was looking to grab a late 3 PM lunch in the neighborhood and decided it was the perfect opportunity to finally see what the fuss was all about. It was 3 PM, the line’s gotta be short, right? Wrong. Of course there was a line and it was just as long as any other time of the day, but this time I decided to grit my teeth and bear it. Ultimately, it took 45 minutes to be granted access so we could take our seats at the hundred-year-old bar counter. Pro-tip: I often see peopling BYOing with unmarked cups while they wait outside of Swan. This is a great idea! At least with perpetually pleasant weather and a drink in hand, waiting outside wouldn’t be so bad. So we walked past the front window which was loaded with all sorts of gorgeous looking seafood and side-shuffled our way back to our barstools in the rear of the narrow restaurant while oogling at all of the nautical decor and other tchotchkes covering the walls. We were immediately greeted by one of the most genuinely friendly servers I’ve ever dealt with and he happily guided us through our first Swan Oyster Depot experience. Later, I learned that this man was Tom, Swan’s owner. He sure knows how to treat his customers well. To kick off the meal, we all decided to start with a cup of their famous Boston Clam Chowder. One single spoonful and I was in love. The broth may have separated a bit, but it was that intoxicatingly oceany, fresh clamminess that made it so incredibly delicious. Make sure to dunk some of the provided crusty sourdough bread into the hearty, creamy soup to fully enjoy the awesomeness. 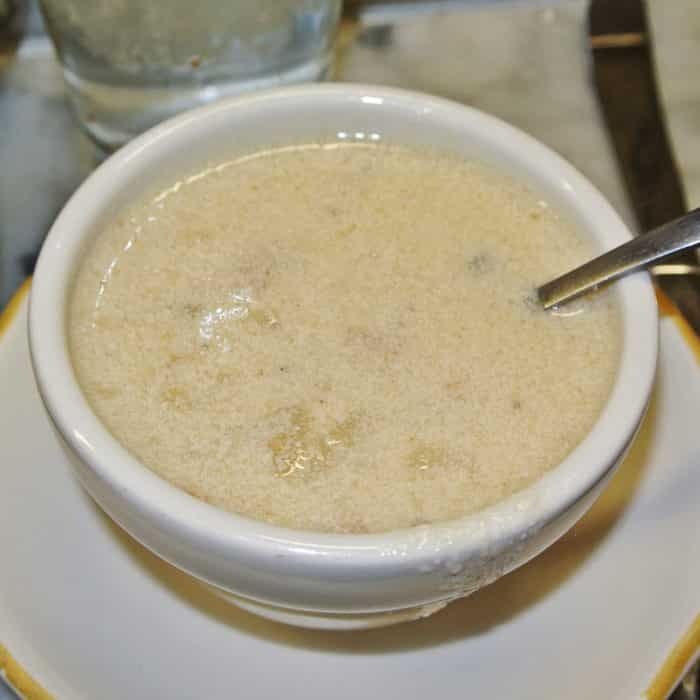 This was certainly the most flavorful and interesting clam chowder I’ve ever had – yes, even better than the one I loved at Phil’s Fish Market – and it was extremely comforting and cheap at only $2.75 for a cup. I’m sure I’ll be back for more once the weather in SF cools off for good. Now, this next dish wasn’t specifically written on the menu that covered the wall overhead, but we had heard there was a sort of sashimi you could have made for you at Swan. 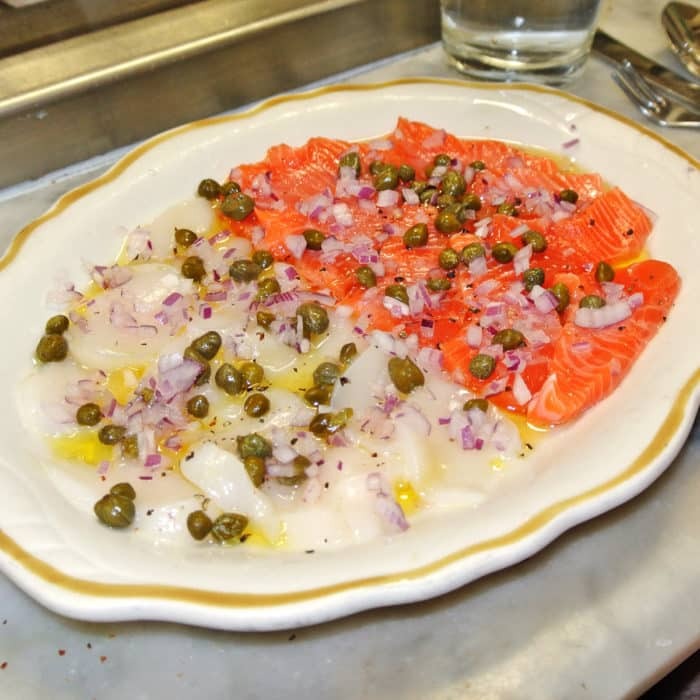 So when our super-friendly server returned, and we asked him about it he happily prepared us a plate of something he called Sicilian Sashimi half with salmon and half with scallops. 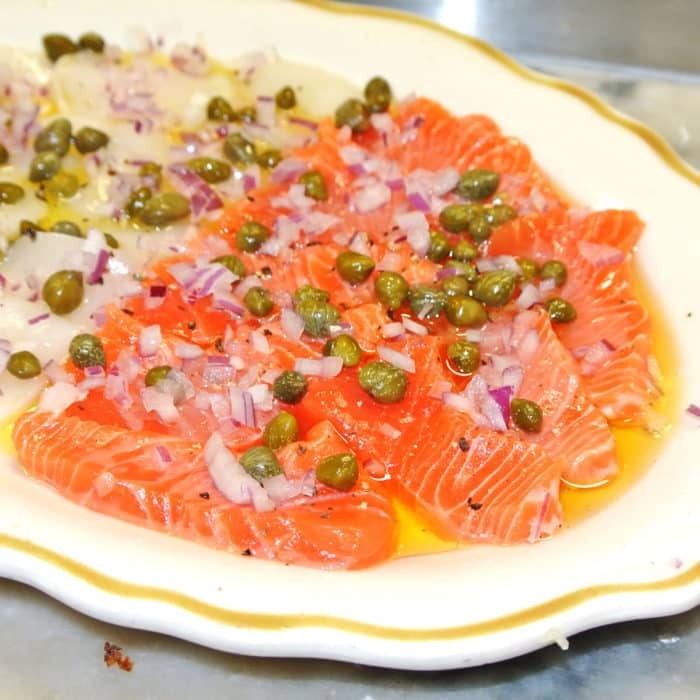 To create this Sicilian Sashimi, the raw scallops and salmon were sliced thin and laid in a pool of high-quality olive oil and dressed with a heavy handful of capers and diced red onion. It looked gorgeous, but it tasted even better. The simple preparation really allowed the quality and freshness of the thin-sliced seafood to shine. 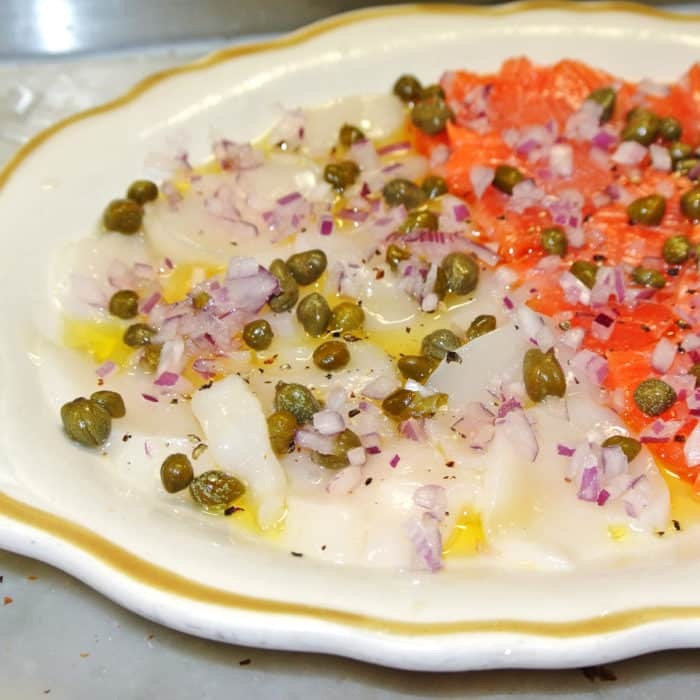 The olive oil slightly cured the exterior of the fish sort of like ceviche and the capers added a pleasant saltiness and textural contrast to the silky, buttery sliced salmon and scallops. Both sashimi styles were incredible, but I’d have to give those scallops the edge if I had to choose. But you really can’t go wrong with either. But there was one more item that I couldn’t resist splurging on and indulging in before leaving my hard-earned barstool – the Live Uni. I had noticed someone else order it and when I saw that fresh, live uni being prepared so laboriously, I knew I had to have it too. When you order uni at Swan, your server will walk up to the front window to grab a live – yes, live – sea urchin from the ice. He will then attack the spiny sea creature with sharp kitchen shears until it’s tongues are plated beautifully in a bowl made of the still-moving spiky casing, ready to be devoured. The portion was absolutely massive, particularly because I was going at this dish on my own. I actually usually prefer East Coast Uni over the West Coast varieties, but this insanely fresh West Coast Uni was so outstanding that I wasn’t even thinking about the alternative. I sometimes find the West Coast stuff to be a little metallic tasting, but there was none of that unpleasantness in this spectacularly fresh preparation. 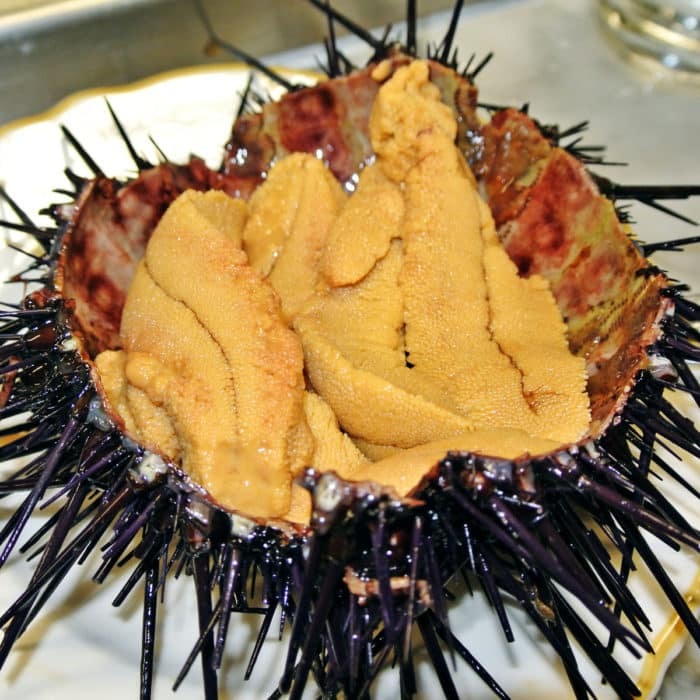 This urchin included five humongous, plump, pale orange tongues of uni – each with a rich custardy texture and a touch of ocean mist flavor. Everything about it was absolutely wonderful and it just felt sinfully excessive to eat the entire uni’s worth of tongues by myself in one sitting. But I have no regrets. Now, I know it seems like I committed a cardinal sin by not ordering oysters at a place with word “oyster” in their name on my visit. And I know Bourdain loves their cracked crab too, but rest assured with seafood this incredibly good so close to home, I’ll be back to try it all very very soon. 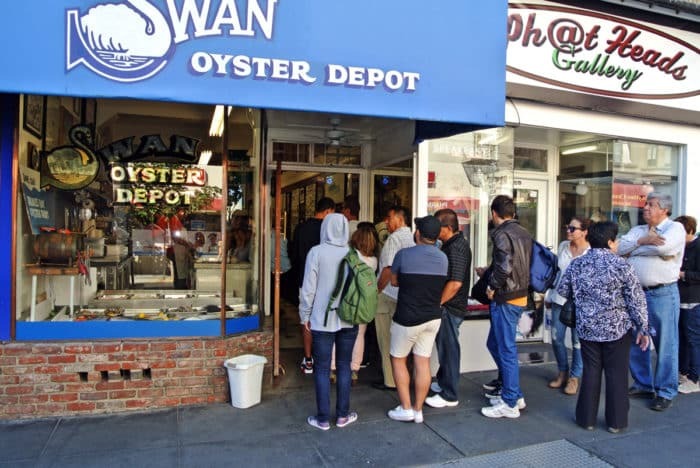 Believe the hype, Swan Oyster Depot is worth waiting in line for. Just remember to bring cash and plenty of it because you’re gonna want to splurge on a lot of ridiculously good and incredibly fresh seafood. 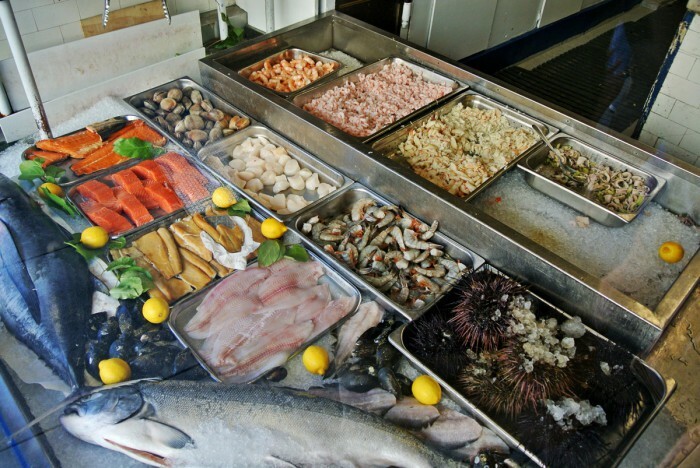 Got another outstanding seafood spot in the San Francisco area that I need to check out? Let me know in the comments below. Next PostOutstanding Sustainable Seafood on the Sausalito Waterfront at Fish.